Update: Finally, after oodles of tries, RNG smiled on me. See my reply below for the details. I have the materials to Zeta Bossk's lead, and I have sufficient gear saved up (yes, a hundred and dang fifty stun cuffs) to push Dengar up to G11 (but I'd rather give that black eyeball to Asajj) and either Cad to G11 OR Greedo to G10. My question is, do I need to, or am I good as is? 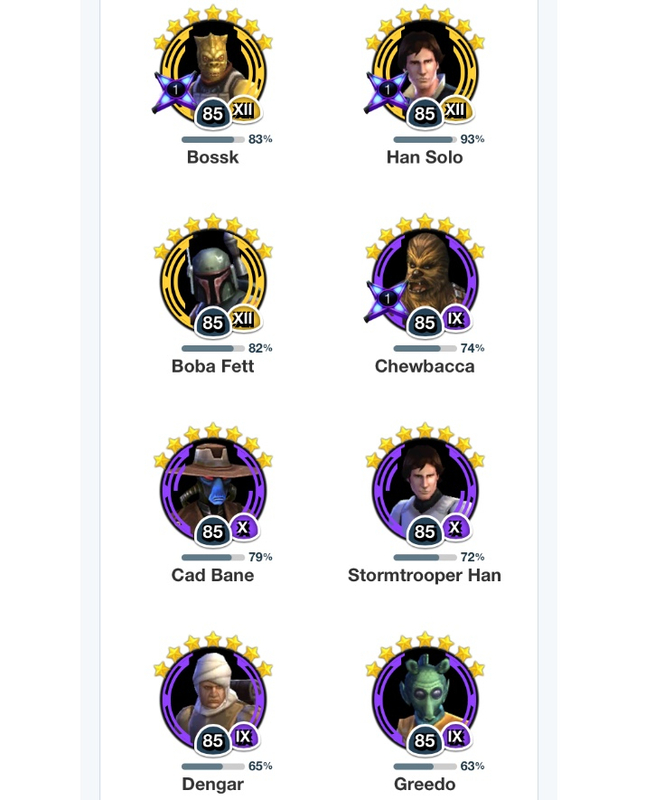 And if so, Cad or Greedo (and which would be better for other uses in the game besides the Chewie event)? You don't need to upgrade Dengar, it's a waste of gear. The only thing he does in this event is prevent R2 from stealthing everybody. Mostly agree. If Dengar doesn't go under stealth and then R2 stealths everyone, then it's a restart anyway. If Dengar is under stealth, he's generally survives pretty well as he can only be hit by AOEs at that point. However, he can be useful in finishing off Han because he can stun him, can avoid Han's counter when attacking him under stealth and his detonator AOE can't be countered. The general rule I apply is: who is dying first before doing whatever it is I need them to do? That's who I focus for gear. Your working too hard, this event is not really about Gear, which leader you use, or even how you mod the hunters. This is ENTIRELY a round of who can get the right RNG. not this. just bc you got lucky after roughly a gajillion tries shows that. anyone posting about all g12 seems to have garbage mods or no mods on some chars. Don’t be needed, ON THE HUNT zeta. Same squad. Lower geared Dengar. With lots of speed and potency by mods. I had recommended this to some of my guildmates, and few minutes later, they have unlocked 7* Chewie immediately. Got it on the second try - Dengar didn't stealth on the first. Greedo died but it was still quite doable. Didn't even complete Bossk's contract until three of them were already dead and the win thus already pretty much sealed. So if you gear up your Greedo a bit I think you'll be fine since you have the benefit of an extra stun from Cad. Cad should be OK, I think? I don't think he's as squishy as Greedo or 88. Not 100% sure. Though he's still worth gearing up for his ship. Above posters are correct that Dengar doesn't need tons of gear as he will likely be stealthed and thus survive just fine. He is mostly there to prevent Smoke Screen and provide mass healing with his grenades via Bossk's zeta. You probably can do it without a zeta on Bossk's lead, but it does make it a lot easier, plus it's just a great zeta to have anyway as it totally elevates your BH team. I tend to assume that the people moaning that they have a full G12 squad and still can't beat it must have absolutely garbage mods. Or they ignored the last 3 months of people saying "get Dengar if you want to win." I finally got the big walking carpet! As you can see, I had a lot of potency on them from previous attempts using a Boba lead. So the mods were good but mostly not optimized. Cad, presumably recognizing that this was an OT-only fight, politely got targeted and vaporized in the opening salvo. His stun was useful (if contributions to an extended litany of failure can be termed 'useful'), but he was definitely the most expendable of the quintet. Thus, much to my delight, I made my first move with four hunters in green health and a stealthed Dengar. From there I followed standard protocol (Boba Execute, Bossk taunt, etc. ), with a kill order of Chewie -> Leia -> Han -> Lando -> R2. I believe my payouts triggered right before or as Han died, but by then it was mop-up duty. I finished with Boba and Dengar still standing to see six Thermal Detonators go off on R2 simultaneously. Honestly, Greedo was the quiet MVP for me. Obviously Bossk/Boba/Dengar are key (they ARE the three pictured brawling with Chewie in the event icon, after all), but it was modding up Greedo's Crit Chance and having him chain several shots together that really made the difference in my successful run. So I offer many thanks to the folks who took the time to respond to me here, as well as the community whose posts I have been analyzing obsessively for the past month. Special shout-out to a one DarkHelmet1138, whose post here [<-link] from September put me on the path I needed.